How many of you remember the Care Bears from the 1980’s? 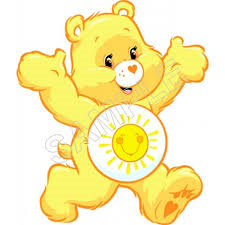 This cheery bear was known as Funshine Bear. He was one of the ten original Care Bears who first appeared on greeting cards by American Greetings. On the cartoon series, Funshine Bear was known for always looking on the bright side of life. He was happy, always in a good mood and ready to help others every day. He was known to use his sunshine tummy symbol to light up the darkness and radiate sunshine everywhere he went. I want to be a Funshine Bear! In all the darkness and hatred in this world, we need a whole nation of Funshine bears!! This entry was posted on August 15, 2017 with tags: #makeadifference, kindness by Deanna Young.